Rabbit anti Human, Mouse, Rat 14-3-3 protein gamma. 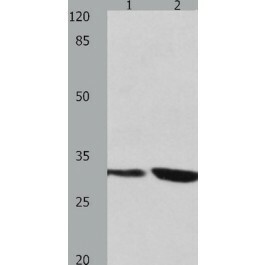 Synthetic peptide corresponding to a region derived from 141-154 amino acids of Human tyrosine 3-monooxygenase/tryptophan 5-monooxygenase activation protein, gamma polypeptide. This gene product belongs to the 14-3-3 family of proteins which mediate sigl transduction by binding to phosphoserine-containing proteins. This highly conserved protein family is found in both plants and mammals; and this protein is 100% identical to the rat ortholog. It is induced by growth factors in human vascular smooth muscle cells; and is also highly expressed in skeletal and heart muscles; suggesting an important role for this protein in muscle tissue. It has been shown to interact with RAF1 and protein kise C; proteins involved in various sigl transduction pathways.